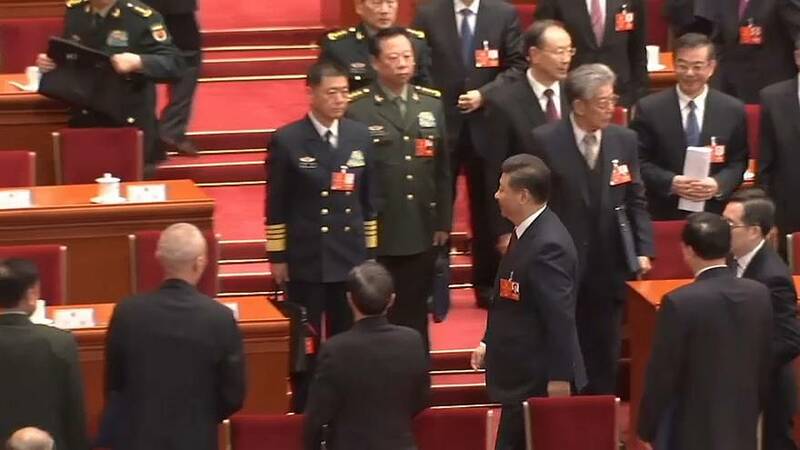 China is holding its annual parliamentary congress and delegates have greeted with enthusiasm the Communist party's proposal to end presidential term limits. Despite criticisms the party is abandoning safeguards against Mao-style personality cults or despotic rule, party loyalists say the move is popular with the people, with others saying the nation is lucky to have as great a leader as Xi Jinping. Allies have been lining up to endorse the move ahead of a vote. "We will resolutely safeguard General Secretary Xi Jinping's core status and the authority of the party's central committee and its centralised and unified leadership," said Prime Minister Li Keqiang. Intruding somewhat onto the agenda is President Trump's announced tariffs on steel and aluminium imports from, among others, China, but the prime minister dealt with that in a simple statement. "China will unswervingly promote the globalisation of the free economy and protect free trade. We are ready to work with all relevant parties to advance multilateral trade negotiations and will work to soon conclude negotiations on the Regional Comprehensive Economic Partnership and speed up efforts to build the Free Trade Area of the Asia-Pacific and the East Asian Economic Community. China calls for trade disputes to be settled through fair discussions, opposes trade protectionism, and will resolutely safeguard its lawful rights," he said. President Trump praised his opposite number's consolidation of power at the weekend, calling it "great", and he quipped that he and the Republicans might try a similar reform to the US constitution.